This statement makes no sense if you are thinking calorically, but it makes perfect sense if you are thinking hormonally. Fat acts like a control rod in a nuclear reactor, slowing down the entry rate of carbohydrates into the bloodstream, and thereby decreasing the production of insulin. Fat also sends a hormonal signal to the brain, telling you to stop eating, which is another way it reduces insulin production. Since it's excess insulin that makes you fat, having more fat in the diet becomes an important tool for reducing insulin. The best type of fat to add to your meals? 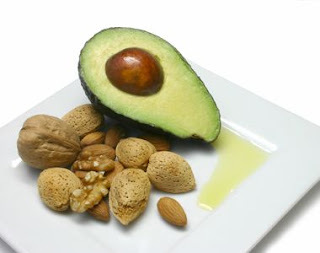 Monounsaturated fat, like olive oil, guacamole, almonds, and macadamia nuts.